Future and Cosmos: Why Are Our Genomes Smaller Than a Lily's, and Our Brains Smaller Than a Caveman's? Some biologists keep perpetuating simplistic ideas about DNA and the brain, but sometimes the facts biologists discover seem to conflict with such ideas. One idea often advanced is that our DNA is some kind of blueprint for the body. Nature never told us such a thing, but it has been a convenient assumption for many. However, when we look at the size of the genomes in DNA, we find that some organisms much simpler than humans have genomes much bigger than we do. If you do a Google image search for “genome size by base pairs,” you will see a variety of graphs like the one below. 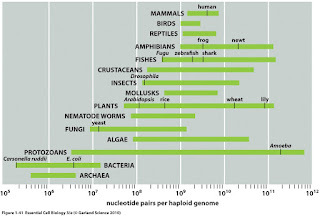 If we judge genome size by the number of nucleotide base pairs, we find that certain type of amphibians such as newts have a much larger genome than human beings. 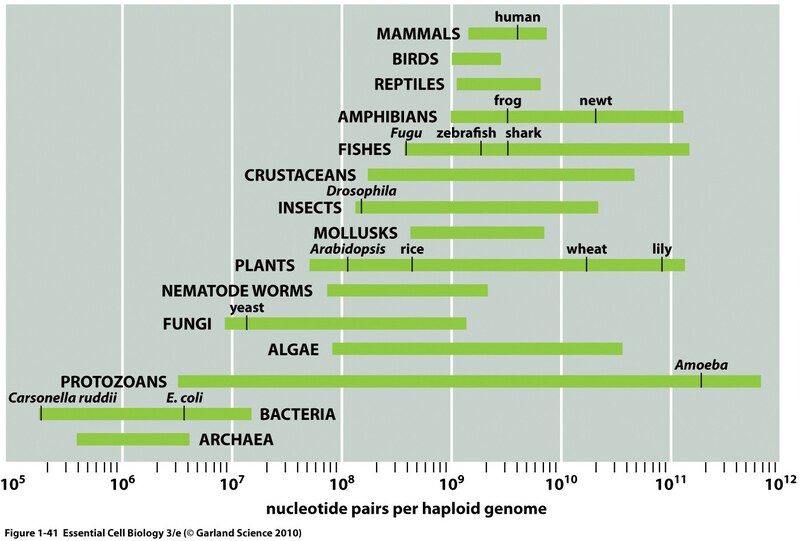 According to the graph below, from one of the fine science textbooks of Garland Science, the humble lily plant has a genome more than 10 times bigger than a human's, as does an amoeba. According to this link, a particular flowering plant has a genome 50 times bigger than the human genome. The paradox that genome size does not correspond to the complexity of a species is known as the C-value paradox. A related paradox (that the number of genes in an organism does not correspond to the organism's complexity) is called the G-value paradox. A rice plant has more genes than a human. Only a tight-knit circle of paleontologists seem to be in on the secret, and even they seem a bit muddled about the matter. Their theories as to why the human brain is shrinking are all over the map. One cognitive scientist quoted in the Discovery article suggests that this means humans are actually getting more stupid as time goes on. But such an idea is contradicted by evidence regarding the Flynn effect. Based on scores on standardized IQ tests, human intelligence seems to be increasing by about 1 percent per decade. What can we infer from the fact that our genome's are much smaller than a lily's and that our brains are much smaller than a caveman's? One inference is that some modern biology dogmas are unfounded. One such dogma is the claim that DNA is some kind of blueprint for an organism. There has never been a sound basis for this idea, which has been advanced without proof by countless writers. DNA is properly thought of as a list of the chemical ingredients used by an organism. The minimal poor-man's “language” used by DNA is a language capable of stating only a list of amino acids. There seems to be no way that DNA can possibly be stating either a three-dimensional specification of the body plan of an organism, nor any type of set of instructions for constructing a three-dimensional object. Let's imagine I have a minimal, poor-man's language that has only 7 words in the language. The words are “bread-slice,” “ham-slice,” “cheese-slice,” “tomato-slice,” “turkey-slice,” “lettuce,” and “baloney-slice.” With this language I can specify endless varieties of sandwiches. But I cannot at all specify a blueprint for a house or a three-dimensional organism. The “language” used by DNA is like such a poor-man's “sandwich language.” The only difference is that instead of having 7 such words, the DNA language has only nouns that are the names of 20 amino acids. Besides the fact that there is no way to state a complex 3D blueprint in DNA, there is the fact that even if such a thing were to exist in DNA, there would be no tiny component in the body capable of interpreting instructions so complicated. 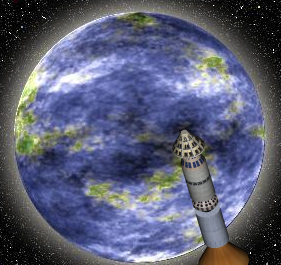 Blueprints are only useful because there are human minds that can interpret them and bring the design plan to fruition. There is nothing like a 3D blueprint interpreter in a human cell capable of interpreting 3D assembly instructions if they existed in DNA. The claim that DNA is some kind of blueprint giving the complete layout of an organism is a piece of simplistic nonsense, unsupported by fact. The C-value paradox and the G-value paradox contradict such a claim. If DNA was a blueprint for organisms, we would expect humans to have a genome 10 times bigger than the genome of a lily, but instead we find the opposite. Belief 1: We've found one little piece in the puzzle, but it can't be anything close to the full answer. Finding the full answer may take centuries. Belief 2: This is the answer that explains it all! Belief 2 became popular because it was reassuring, and people love simple, triumphal stories, even when they don't make sense or are not consistent with the facts. Just as the C-value paradox argues against the "DNA as blueprint" dogma, the claim by anthropologists that 20,000 years human brains were significantly bigger conflicts with the idea that the human mind is merely the product of the brain -- unless you want to believe that cave men were smarter than Plato. Another fact conflicting with such a claim is the fact that crows (with a tiny brain) have been repeatedly observed in experiments to have very high mental functioning. Below is a table listing some simplistic ideas in biology. Each of these simplistic ideas currently enjoys a popularity it does not deserve. DNA is a blueprint for an organism, storing its entire specification and body plan. DNA is simply a list of chemicals called amino acids, and cannot state very complex algorithmic instructions (or a three-dimensional blueprint). There's no natural way in DNA to express complex hierarchical information or advanced conceptual information. How can DNA be a blueprint when the lily's DNA is 10 times larger than the human DNA? (The C-Value paradox.) DNA is mainly just an ingredient list, not a blueprint. We do not understand where or how the body plans of organisms are stored. Understanding that may take centuries. The human mind is something generated by the brain, just like bile is something generated by the liver; and memories are all stored in the brain. There is no understanding of how neurons could generate consciousness. Since synapses are subject to rapid protein turnover and structural turnover, there seems to be no way brains could store memories for even a year, but memories last 50 years. Anomalous experiences such as near-death experiences suggest the mind can operate when the brain is shut down. There are quite a few cases of people with high mental function despite very heavy brain damage (e.g. Lorber's). Consciousness, memory and the human mind are mysterious things we don't understand. They may involve or have as their source some cosmic reality that transcends the brain. Biological innovations and the origin of species occur because of random mutations and natural selection. The incredibly complex biochemistry in organisms is too complex and functional to have arisen from random mutations, which are almost always harmful. Natural selection and random mutations cannot explain the origin of very complex systems that would provide no “survival of the fittest” benefit until many parts had been assembled in the right way. The fossil record shows all existing animal phyla appearing suddenly in one big clump, the Cambrian Explosion, rather than the phyla appearing gradually over 500 million years. The human mind has many aspects that have no survival-of-the-fittest value, so they cannot be explained by natural selection. We do not understand how biological innovations arise, and do not understand the origin of species. Some biological innovations may have occurred because of some purposeful interventions (possibly extraterrestrial) that occurred long ago. Or perhaps there is a natural explanation vastly more complex than natural selection. Understanding our origins may take centuries. The 3D shapes of proteins (protein folding) are determined merely by the 2D sequences of amino acids in DNA. There is no way to account for how 3D protein shapes could be determined by a mere 2D sequence of amino acids. Small changes in an amino acid sequence can cause huge changes in 3D protein structure, while nearly identical 3D protein structures can have almost no similarity in the amino acid sequence. Neither such thing should be true if a 3D protein shape is determined by the 2D sequence of amino acids. Protein folding is a mysterious phenomenon science has failed to explain despite decades of research. Protein folding may be caused by some mysterious life force that also drives morphogenesis (the progression from a fertilized egg to a full human).